Don’t be surprised if Darth Vader, Boba Fett, Princess Lea or Yoda knock on your front door this Saturday. Star Wars is dominating the 2015 Halloween costume craze. 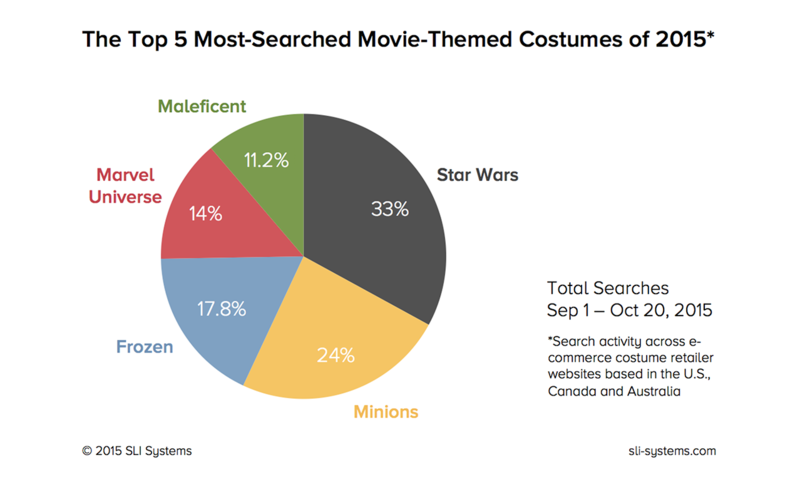 Data released by SLI Systems found site searches for Star Wars-related costumes far exceeded those for other recent popular movies including Minions and Frozen. In fact, this Halloween season, consumers conducted twice as many costume searches for Star Wars characters than Frozen characters, which were the most-searched costumes in 2014. The National Retail Federation forecast that 68 million Americans will dress in costume this year, with total spending on Halloween topping $6.9 billion. Blockbusters are again leading costume trends this year and Star Wars is an unmatched force with nearly 37% greater interest than Minions – the next closest film. Anticipation of Star Wars: The Force Awakens is clearly attracting new generations, adding to decades of loyal fan numbers. When the SLI data team compared the most popular site search terms across costume retailer websites, SLI CMO Tim Callan said the company found interest in current events as well. For instance, searches for “Trump’ increased significantly, with 33 times more searches than the same timeframe in 2014.